« I’M BAAAAACCCCKKKK!!! So Sorry for All the Delays While Moving to My New Web Host! I have to admit that I am a very sentimental gal at heart. I love to decorate my home with items which remind me of very special moments in my life. After all, that's how I try and turn just a house into our family's home. 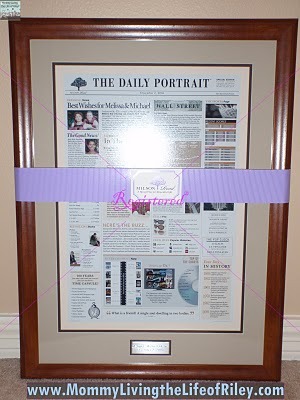 Milson Road is a company that believes in reminding us of very special moments too, through a very timeless and elegant framed custom print called The Daily Portrait. 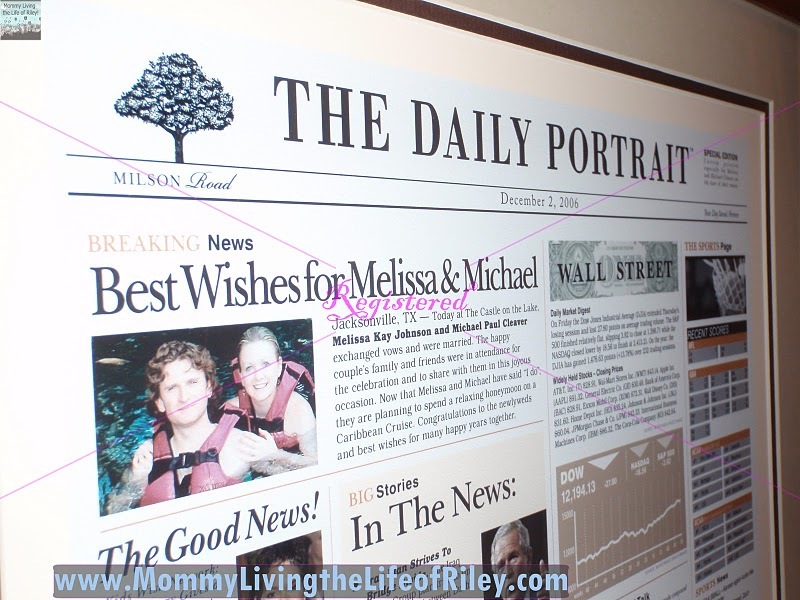 Read more about my experiences with The Daily Portrait for a Wedding Anniversary and how Milson Road helped me to add one more sentimental treasure to my home's collection! I reviewed The Daily Portrait for a Wedding Anniversary from Milson Road, which retails for $165.00. 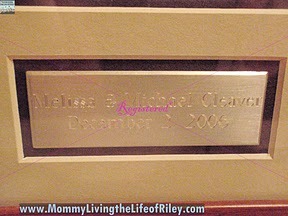 The custom options I chose were the Walnut frame, Khaki and White Mats and Silver Engraved Plate. After looking extensively at the Milson Road website and considering many different options, I decided to customize The Daily Portrait to reflect our anniversary. I came very close to ordering this to commemorate my daughter's birthday, but because we have a large empty area in our hallway that I have been dying to decorate, I thought the anniversary option would work better. Next, I needed to go to the Milson Road website in order to begin customizing my Daily Portrait. I expected this to be long and complicated, but actually, it was pretty easy. The hardest thing about customizing the Daily Portrait was choosing which frame and mat combination I wanted. Now, unfortunately, this was partly due to the way Milson Road's website is organized. When I clicked on "Anniversary" from their products page, I was taken to a section specializing in anniversary editions of the Daily Portrait, which was great. What was not easy to figure out though, was the next option choice, "Choose Your Background Color". First of all, I didn't really know what they meant by that. Were they referring to the mat, or the frame, or the color of the wall it would be hanging on? I chose Light Green to start and another pop up window showed which then asked for my Frame/Mat/Plate combination. I opened this window only to find that the frame/mat/plate combination I wanted wasn't there. This puzzled me because I was just looking for a brown frame first and wanted to see what all of my mat and plate combinations were with this frame. Unfortunately, that is not an option. I really wish that Milson Road would get rid of the very confusing "Choose Your Background Color" and just start with allowing me to choose my frame color. I ended up having to search through a myriad of "background colors" before finally choosing "Black". Once I did, I saw the frame/mat/plate combination I wanted all along, which was a Walnut Frame/Khaki and White Mat/Silver Engraved Plate. The problem is that I wasted a lot of time just to find this combination. The rest of the process was very quick and easy. I merely had to insert the date I wanted to commemorate, list our names and a few other details about our wedding and honeymoon, and then upload a photo and checkout. I decided to upload a photo of my husband and I snorkeling in Mexico on our honeymoon. This part was really a snap! A few weeks later, my custom Daily Portrait arrived and I couldn't have been happier! It was gorgeous! 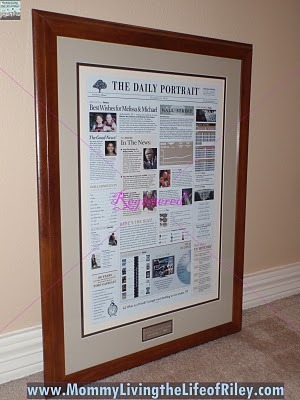 As you can see from the pictures above, The Daily Portrait is a generously sized framed print. The outer dimensions are a little over 21" x 28", which really makes a beautiful statement on your wall. The frame has beveled edges for a classic look and the double two-tone mat really highlights The Daily Portrait which is professionally framed inside. The best part is that we now have a permanent chronicle of what was happening on the day my husband and I were married! I loved reading over the different facts and figures of the day and know that I will reread this many, many times over the years. I think it is also neat that we can show and explain to Riley what things were occurring in the "good old days" when she gets a little older. The only part of the Daily Portrait that I didn't care for was the feature humanitarian story on Halle Berry right underneath our article. I absolutely loath Halle Berry and the article there just talked about how she met a fan with a life-threatening illness. In my opinion, this wasn't really any kind of story which summed up the date and I wish it would have been replaced with something else. I highly recommend The Daily Portrait from Milson Road. They have found a way to permanently capture the history and events happening in the world on your special day. There are so many wonderful occasions you could commemorate with The Daily Portrait, such as birthdays, anniversaries, weddings, bar mitzvahs, graduations, etc. This would make the perfect gift for a baby shower, wedding, anniversary or birthday party or even a housewarming present for someone who has just moved into their first home. Disclosure: I received The Daily Portrait for a Wedding Anniversary from Milson Road in order to facilitate my review. No other compensation was received. This product review is based on my own personal experiences with this item and is completely honest and objective.